Near-field coherent sensing (NCS) demonstration in an automotive seat. 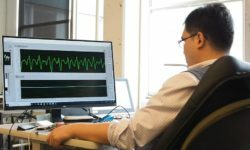 Edwin Kan and his team developed a non-invasive, low-cost method to monitor human and animal vital signs using passive and active radio frequency (RF) transmissions. Using near-field coherent sensing (NCS), researchers are able to measure internal body movement, such as a beating heart, in a precise, non-invasive method. This technology could be used in a broad variety of applications, but sometimes innovations need to be refined down into very specific applications before they can showcase their value in a particular industry. “My group under the university research receives federal funding mostly to demonstrate innovative concepts that are broadly applicable, where specific product development is excluded,” said Kan.
As a 2018 Cornell Technology Acceleration and Maturation (CTAM) Fund recipient for a project titled “Accurate and reliable scoring of alertness and sleep states in seats and beds,” Kan was able to build specific prototypes and perform realistic demonstrations. The group assembled an automotive seat utilizing the NCS sensors that could retrieve the driver’s cardiopulmonary waveforms to determine alertness. They also integrated a sensor into a mattress to measure sleep study scoring. The Cornell Technology Acceleration and Maturation (CTAM) Fund was implemented to give Cornell technologies that might be considered “too early” for a commercialization partnership an opportunity to further develop the technology. CTAM’s objective is to address the “invest-ability” gaps and “license-ability” that deter signification investment, strategic partnership, or acquisition. For each CTAM project, the fund provides up to a $50,000 investment that can be used for activities such as prototype development, beta-testing, data analysis, market research, and business plan refinement. Without the assistance of CTAM funding, Edwin Kan and his group wouldn’t have been able to build these specific prototypes, perform realistic demonstrations, and collect initial evaluation information. Kan and his team have plans to further refine NCS demonstration kits on small PCB boards, ideally working with a large electronic hardware company with strong integrated circuit experience.